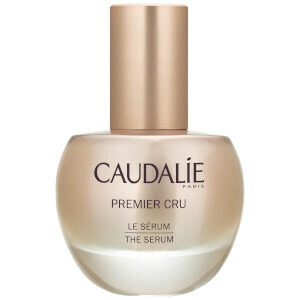 Give skin an instant radiance boost with Caudalie Premier Cru The Precious Oil, a dry oil formula that delivers visible anti-ageing effects. Absorbing effortlessly into skin, the oil helps to smooth out the appearance of wrinkles, restore skin density and brighten dark spots and discolouration. Whether worn alone, after using serum or mixed into moisturiser, the oil leaves the complexion firmer, more comfortable and noticeably youthful. 99.5% of ingredients are of natural origin. Mix a few drops with a day or night cream to boost its nourishing effect or with a foundation for a beautiful glow. Use it on its own as a night treatment. Coco-Caprylate*, Isoamyl Cocoate*, Coriandrum Sativum (Coriander) Seed Oil*, Simmondsia Chinensis (Jojoba) Seed Oil*, Opuntia Ficus-Indica Seed Oil*, Oleic/Linoleic/Linolenic Polyglycerides*, Santalum Album (Sandalwood) Seed Oil*, Tocopheryl Acetate*, Tocopherol*, Helianthus Annuus (Sunflower) Seed Oil*, Vitis Vinifera (Grape) Seed Oil*, Palmitoyl Grapevine Shoot Extract*, Palmitoyl Grape Seed Extract*, Padina Pavonica Thallus Extract*, Parfum (Fragrance), Geraniol, Citronellol, Coumarin, Linalool (155/025). *Plant Origin.